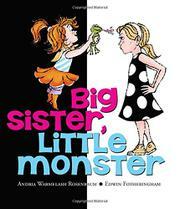 An exasperated big sister learns to love her little monster of a sibling by finding her own inner monster. Lucy has had it with her little sister’s behavior. Mia, who like Lucy is white, always seems underfoot and over-the-top. When Lucy finally loses her temper and calls Mia a “little monster,” Mia disappears. Mia’s reaction to her sister’s rejection isn’t depicted, but at first, Lucy is clearly delighted and revels in time to herself. But a shift in palette from bright to dull, as well as in the tone of the text, signals Lucy’s quick change of heart: “after a while, it felt quiet. Very quiet. TOO QUIET. No one followed Lucy’s lead.” So Lucy sets out to find Mia and discovers a secret doorway in her little sister’s room that leads to a land of monsters. Fotheringham’s style shifts from something akin to Jules Feiffer’s to something more like Ed Emberley’s here, with brightly colored, cartoonish, goggly-eyed monsters cavorting with Mia against a black background. Mia seems perfectly content, and not only do the monsters reject Lucy’s attempts to wrest Mia away, they reject her, too: “ ‘YOU’RE NOT A LITTLE MONSTER,’ they howled. ‘GO AWAY!’ ” But Lucy stands firm and liberates her inner monster with a fit of rage that sends the monsters scurrying away. Mia happily rejoins her in the real world, where their rivalry gives way to sisterly revelry.